Shower Me Blue is a global gumbo of original, ‘heavy Blues Rock’ – a power trio (gran trio rock énergétique) that’s a blend of the throw-back power sounds from the late 60’s British blues bands and a modern, world-beat edge that incorporates our experiences performing rock, jazz, funk, fusion, jam-band, metal and EDM. Having performed for more than 30 years around the world, their influences are both mainstream and obscure, with each member of the SMB crew bringing a unique power and style to their shows. 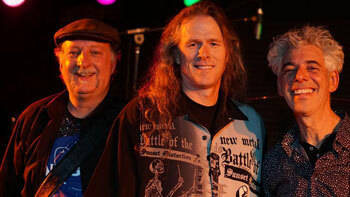 The band consists of Gilles Palmarini (Vocals, Guitar), Dingo Holtz (Drums) and Bill Teags (Bass). How and when did Shower Me Blue first get together, and how long have you been going now? 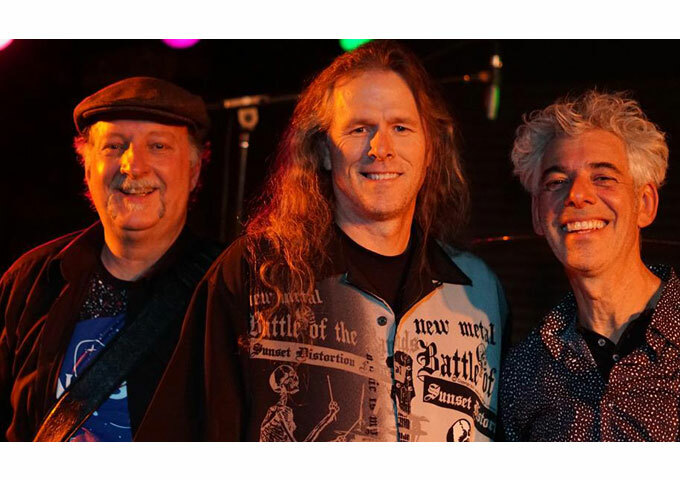 Shower Me Blue: Ummm… first of all, thanks to Rick Jamm for having us answer these questions! Yeah, we had to get up extra early to find the answers in the SMB Googlematic Rastawiki (otherwise known as the small repository of even smaller little grey cells we use to think up these answers)! 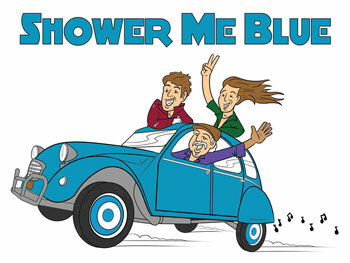 Shower Me Blue: Loud – Energetic – Emotional – Gran Trio Rock Énergétique! Shower Me Blue: We all listen to a lot of different artists, some new and emerging and others are very established. How about – in no particular order: Muse, Joe Bonamassa, Sublime, Imagine Dragons, Deadmau5, Florence and the Machine, Gojira, Noisia, Young The Giant, Joss Stone, John Mayer. Can we mention some of the greats who still inspire us – (Rolling Stones, Cream, The Who, Hendrix, ZZ Top, Judas Priest, Tab Benoit, and John Mayall)? Shower Me Blue: Wow – that’s a long, long time ago! Gilles – a guitar, I think. But I need to add more pedals – and buy more strings again! Bill – a bass, I already had a piano, trombone and French horn. Need more killer soft synths for my MIDI bass! And bigger speakers! Dingo – a cymbal, I already had drums. Need a massively good laptop for my MIDI drums, and sticks, and headphones, and sticks, and many more drums! Shower Me Blue: We each have a shower / rehearsal studio and then we have a bigger rehearsal studio – aka The Cognac Crib. At the Crib we have the ability to track with Pro Tools both live and studio-style. For our new album, we are going into eTown Studios in Boulder, CO for tracking and then down to Wired Studios in Austin for mixing. So, we do a mix of in-house and out-house (outsourcing). Shower Me Blue: Definitely prefer live performances. The scenery is more interesting. And the feedback and vibe we get from a crowd drives our performances. Which one of your original songs currently gets your emotion and adrenalin pumping the most? Does it have back story? Shower Me Blue: We have several actually. There is “Saturday” which is about the birth of Gilles little boy Dylan and then there is “Forgotten”, which is about depression and the terrible toll it takes on people and society. Oh yeah, “Gimme A Reason” adds a bit of adrenaline. There are more, but you’ll have to listen to the new album for yourself – or just come see our show!! Shower Me Blue: There always seems to be one song in each show that seems to transcend above the others. The crowd has a lot to do with which song it is. And then of course, there is that one song in each show where we look at each other and go “WTF just happened? ?” If that happens more than once, we usually look at changing it up a bit (or making the bass player drive to the next show, since he usually screws up the most!). We have definitely done that a few times! There’s a good chance that we may totally change a song just because we get bored (especially of trying to get the bass player to not screw up)! Shower Me Blue: The creative process usually starts with all of us managing to get out of bed successfully. Mostly after a shower / private rehearsal, it is a process of noodling around on a riff or taking a story idea and making something out of it. There is no formula to inspiration! Gilles is always burbling up words or ideas. Sometimes he changes lyrics while playing live based on what the audience is up to. That can lead to a new song idea. We are very open to what is around us and capturing that in a song is important. Shower Me Blue: Do you mean when we first ever started playing or when we got together as SMB? Probably in the beginning of SMB it was figuring out how to pull together the gumbo mix of our various backgrounds. We are all from different parts of the globe and grew up playing different music. It took a while to bring that all together – but it has been a great experience! Rolling back a whole bunch of yesterdays, well, we all had the challenges of learning to play AND to listen. We all learned to be good at listening, both to ourselves and to each other. Listening and experimenting, yeah, probably the things that have changed both performing and creating. Shower Me Blue: Ummm, our ears!! Is an ear an instrument – or a tool? Ah yeah, it’s an instrumentool!! It’s kinda cool that we are able to reach back and recall recording in a totally analog universe and then apply some of those experiences to the crazy digital world we have today. For sure, Pro Tools and laptops have made creating sounds a lot easier, but it’s awesome when they still have a bit of a “serendipity moment” for when something screws up and you end up with another “Aha!” moment. Shower Me Blue: Visual has always been part of rock music, so it’s definitely important to SMB. One of our goals in 2019 is to start adding visuals to our performances. One of the coolest things about EDM is that you have one or two DJ’s onstage surrounded by an incredible light show. There’s nothing wrong with 3 guys onstage playing live rock with an incredible light show. IT’s important that the audience experience a “show” – both audio and visual. Shower Me Blue: Our music does provide social commentary! We have songs about floods, small town people trying to fit in, people suffering from depression, people always buying stuff to be better, social media – all that is around each of us. If you listen to our music, we feel that there is an opportunity for everyone in our audience to relate to something we are singing about. Shower Me Blue: Shooting buckshot at a moving target while going around and around on a merry-go-round! – that’s how the music biz is right now. The internet brought the democratization of the music industry – to a degree. What it really did was turn the funnel process into a giant sieve. There are no defined gate-keepers anymore – they are kinda hidden. What you see in the music biz is what you see in a lot of industries. The internet has been a major disruptor to the status quo. So… this means there are huge fights from the giants from the past to try and maintain their hold on ‘their’ market. That almost always fails, but not before there is carnage everywhere. That’s what we have in music today. Record companies were king back when they controlled the pressing and distribution of vinyl (and tapes). Along comes digital and suddenly their business model is no longer relevant. In a way, that was good, as they forgot that it wasn’t the physical record that was important, but the CONTENT ON THE RECORD that was important! The bad part is that we no longer have that magic funnel that sorted out good artists from mediocre. Now, anyone with access to software and the internet can create ‘music’ and upload it to a digital service, whether it is good or not. So, the background noise level has gone up along with the choices. Don’t get us started on “FREE” – that’s a four letter word! We see the same thing with booking shows too. Shower Me Blue: Probably the fact that we are still having as much fun each time we get together as when we started is something to be proud of. The high point? Every day we are still enjoying life is a blessing and the high point? That’s seeing an audience moving to our music!! Shower Me Blue: Like we said a few minutes ago, the democratization of the music business means we MUST be involved with social media. It’s a love / hate relationship though. The background noise level is so high that it is very challenging to rise above it all. Again, shooting buckshot at a moving target while going around and around on a merry-go-round really sums up our feelings about social media. You gotta play all the avenues, because you never know where the next opportunity will come from. Shower Me Blue: Best advice? Probably from a producer / manager / friend in Nashville who said “Be super-tight! You are a 3 piece and not some freaking jam band!” That still gives us focus. There’s tons of advice we’ve been subjected to over the years that we probably should have followed. But we each own our choices, and for whatever our reasons, we choose to follow or reject advice, knowing that our decisions are what make us who we are. Besides, what are the hidden motivations for the advice?? Hey! Didn’t someone once tell us not to answer 20 question interviews?? Shower Me Blue: Ooooh! Hot button issue! There are really great people out there wanting to genuinely help artists, especially indie artists. Then there are people out there who see a bunch of star-struck artists staring at this giant mega-swamp of choices, and pitch them snake-oil promises. We all have dreams of walking on the big stage, but very few realize that there are no real, genuine over-night sensations. It’s just a long, hard, painful road that requires far more dedication than just about any other job on earth! What we really need is a kind of Better Business Bureau for Music to rate the people and companies that are supposedly out to help indie artists be successful. Fat lotta luck that will ever happen! Do you have a specific musical vision hidden somewhere in your closet…or mind, that you haven’t yet been able to realise for technical, financial, or other reasons? Shower Me Blue: Wasn’t it our secret goal to create the ultimate song that could be played more times than “Happy Birthday”? Yeah, but once we realized that someone had already written “Happy Birthday”, we moved on to other killer conquests. Probably the biggest vision we have is to create a more visual show. The size of the venues and the money needed are keeping this vision hidden – for the moment. Shower Me Blue: We are going into the studio to do a full length album in December. Look for it to be out early next year! The studio is eTown Studios in Boulder, Colorado. eTown is a great facility! We have Stuart Sullivan coming up from Austin to produce. Stuart has worked with just about everyone in Austin (Stevie Ray and Jimmy Vaughn, Willie Nelson, Eric Johnson and on and on) and we are excited to have him with us on this project!! We will be announcing release dates and where to get vinyl or downloads early next year. So, follow us on the usual social media platforms (Facebook, Instagram, Twitter) and check in to our website to learn more!